Cooks white or brown rice to perfection every time, then keeps it serving hot for hours. Automatically switches to keep-warm mode when cooking time is complete. 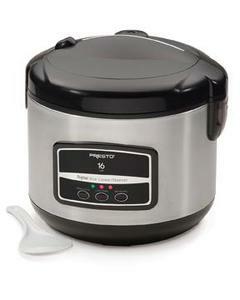 Features digital push button controls with a separate setting for brown rice. Handy steaming basket steams vegetables and cooks rice at the same time. Indicator lights show cook functions for white and brown rice plus the keep-warm mode. Features a stainless steel exterior and easy-to-open hinged cover with carrying handle and removable steam vent. Nonstick pot removes for easy serving and cleaning. Includes nonstick pot, steaming basket, rice paddle, and measuring scoop. Service parts for this product may be ordered on-line using the link below. A copy of the instruction manual is available for download by clicking on the link near the bottom of this page.